According to today’s report from Statistics Canada, consumers paid 2.0% more for goods and services in February compared to a year earlier. Annual inflation was 2.1% in January and economists had expected it would remain at that level instead of declining. Higher gas prices are responsible for the recent spike in headline inflation numbers; at the pump, prices were up 23.1% over the year ending in February. 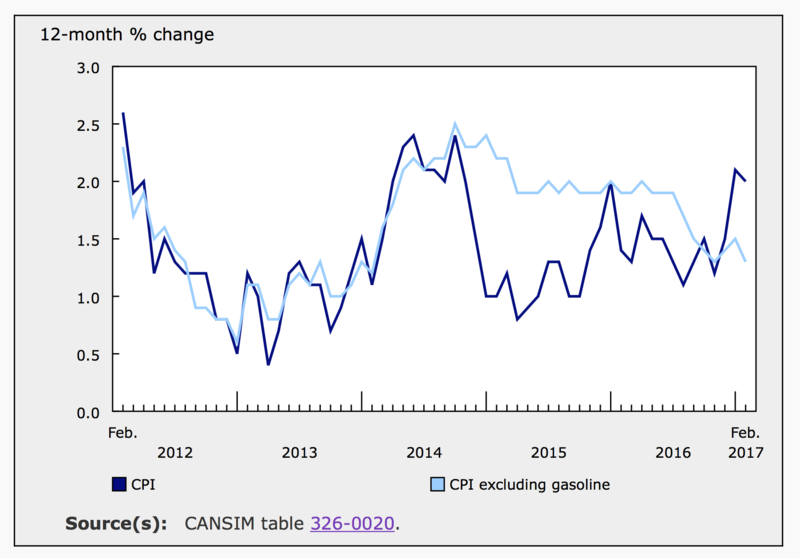 Excluding gasoline, there appears to be little inflationary pressure in Canada’s economy. Annual inflation excluding gas was only 1.3% in February, down from 1.5% in January. Over the year ending in February, prices were up in every major component of the CPI except for food; that index slipped 2.3%, marking its fifth consecutive month of year-over-year declines. The grocery store index fell 4.1% in February, including a 14.0% decline in the index for fresh vegetables and 13.3% decline in the index for fresh fruit. Statistics Canada points out that the current declines in the fresh fruit and vegetable indexes are related to price spikes last winter. The index for food purchased from restaurants continued to push higher in February, up 2.3% for the year. The price of shelter climbed 2.2% even though the index for rented accommodation only added 0.6% over the year. Shelter prices were bolstered by higher home values, represented in the index for homeowners replacement costs, up 4.1% year-over-year, down from 4.4% in January. Property taxes were reportedly up 2.8% and homeowners home and mortgage insurance expenses were 3.6% higher compared to a year earlier. Prices ticked up 0.2% in the month of February despite a 4.9% decline in gas prices. Excluding food and energy, consumer prices were up 0.4% for the month. However, with seasonal adjustments, the all-items index actually slid 0.2% and the core index (excluding food and energy) was flat. In January, the seasonally adjusted monthly rate for the all item index was a positive 0.7%, the highest rate since February 2013; and the core index was up 0.6% in January, the highest rate since March 2016. Prior to seasonal adjustments, three components of the CPI declined in February. The transportation index was down 0.8%. The indexes for shelter and for health and personal care both fell 0.1%. Within the shelter index, the price of tenants’ insurance premiums declined 0.9% in February. Offsetting these declines, both the index for clothing and footwear and for recreation, education and reading were up significantly in February, 2.0% and 1.7% respectively. The index for travel services jumped 9.6%. These price increases are largely related to seasonal pricing patterns. With seasonal adjustments, the clothing and footwear index inched up just 0.1%, after falling by the same rate in January. The recreation, education and reading index added a monthly 0.2% in February. The seasonally adjusted transportation index was down 1.1% for the month and the price of food was flat after falling 0.3% in January. 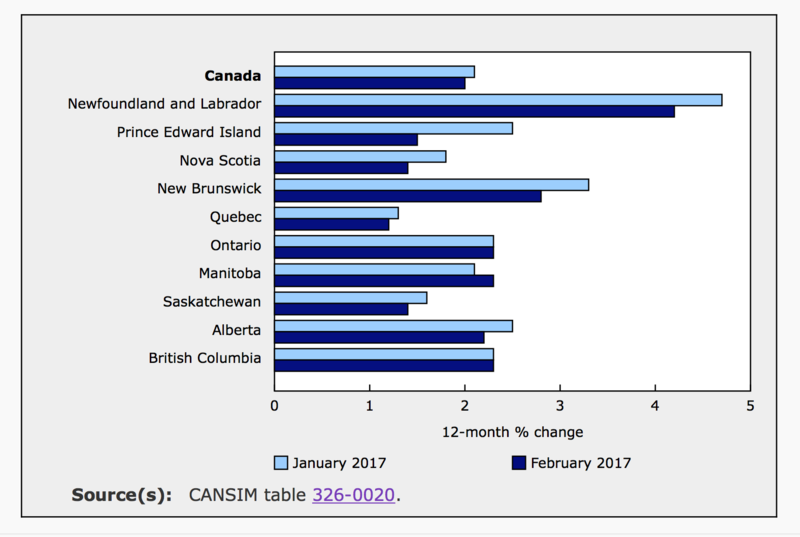 In February, annual inflation slowed in all but three provinces. It was unchanged in Ontario and British Columbia and accelerated slightly in Manitoba. In Prince Edward Island, annual inflation slowed to 1.5%, down from 2.5% in January. This province, with the largest deceleration in annual inflation, saw prices at the grocery store fall 7.5% over the relevant year. Over the same 12-months, Manitoba’s CPI was up 2.3% from 2.1% in January. Telephone service prices were up 6.6% in Manitoba but declined elsewhere. The national average was a 2.2% decline in the telephone service index. Telephone services represent roughly 2.3% of the all-items index. 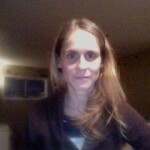 Inflation was unchanged in British Columbia in February compared to January. BC’s inflation did not slow as other provinces did for two major reasons. The grocery store index fell less there than anywhere else and home values appreciated more than the national average. BC’s homeowners’ replacement cost index was up 5.1% year-over-year in February, following a 5.7% gain the previous month. Food prices were only down 0.9% in BC versus 2.3% nationwide. Although today’s CPI report puts headline inflation right on the Bank’s 2% target, the data also suggests that underlying inflationary pressures remain weak. This confirms the Bank’s belief that Canada’s economy is not operating at full capacity. There is room to grow and raising rates at this point would be unwise. If inflation were more robust, the Bank might feel the overnight lending rate should be increased soon as most other economic data is improving. In 2015, the Bank of Canada cut interest rates twice as the economy stumbled on low oil prices and slower growth worldwide. There was very recently talk of another rate cut in Canada but that is likely off the table. Oil prices are moving higher and the US economy is growing despite massive political uncertainty. South of the border, the Federal Reserve raised its benchmark interest rate last week and expects to do so twice again this year. The US is Canada’s largest trading partner and US interest rates impact Canadian consumers. The Bank of Canada will make their policy decision on April 12th. Expectations are that the BOC will leave rates alone until the second quarter of 2018, at which point they anticipate the economy will be closer to full capacity and higher interest rates more appropriate.